Posted 28 June 2013 in Interview. 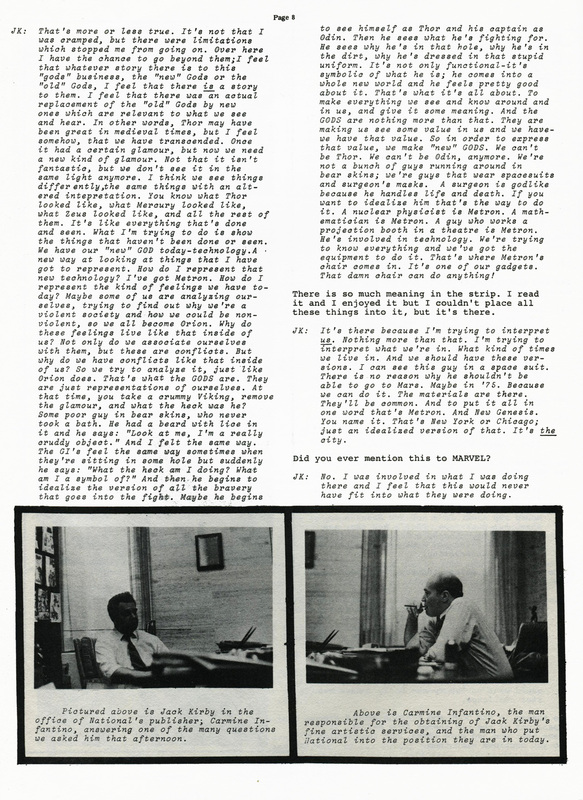 This interview was conducted on January 31st, 1971, in the offices of National Periodical Publications. 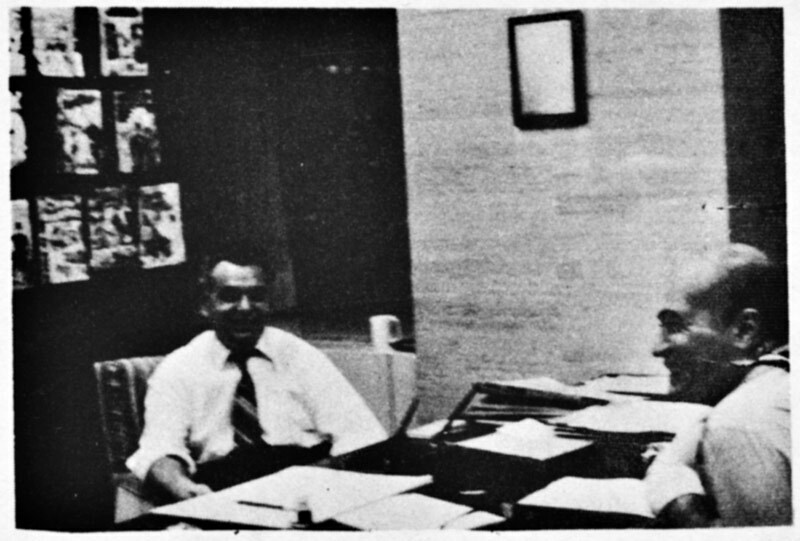 We were fortunate in getting this interview which might never have taken place without the help of Emanuel Maris, John Shike, and Marc Bilgrey. Thanks very much. 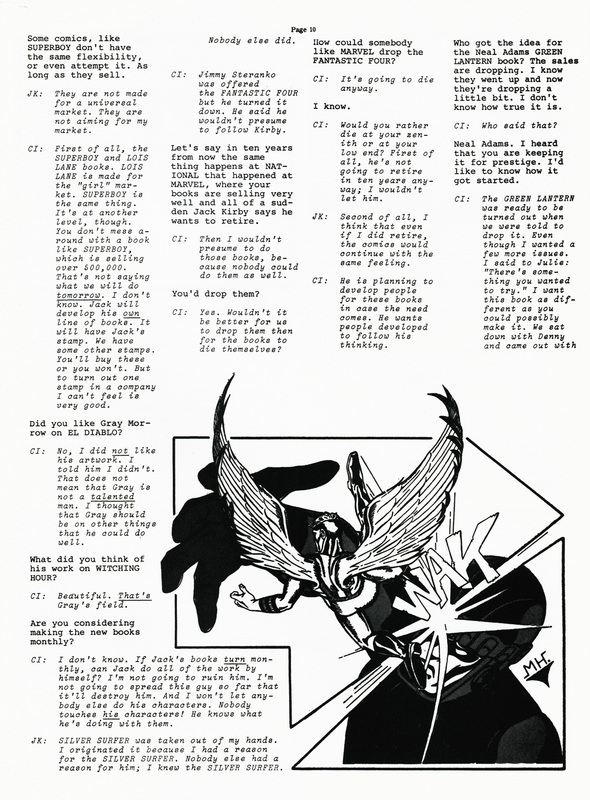 Comic&Crypt: How did you both get your start in comics? 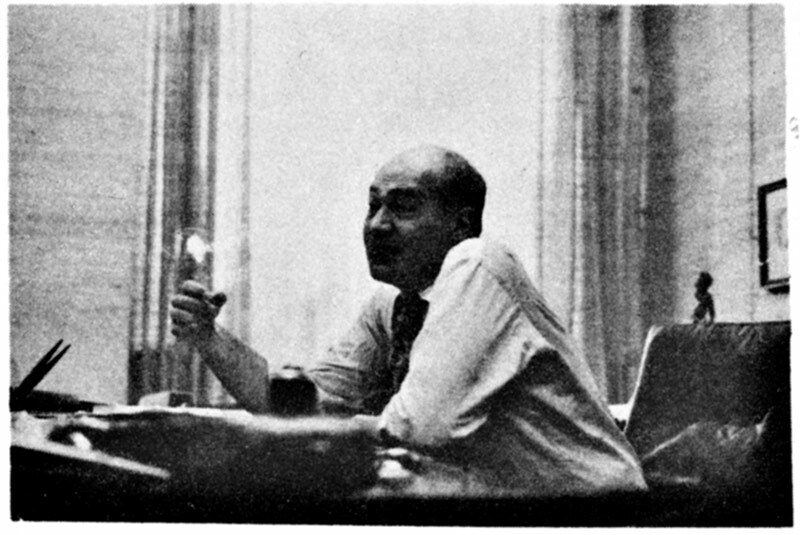 Carmine Infantino: I got into comics the same way Jack did; we were kids of the depression. Now you gentlemen don’t know the depression, or what it was about. It was a period when you starved; your family starved. There wasn’t enough food to go around. This was an outlet for us, a field open to us, and like those who went into prizefighting, we went into comics . 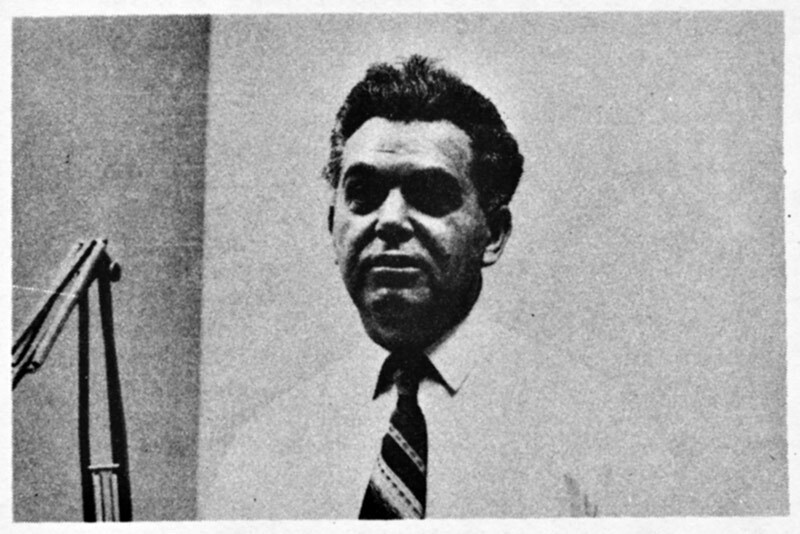 Jack Kirby: I feel the minority people had a lot of drive and went to entertainment or anywhere energy was involved. C&C: Who did you start off with first? Infantino: We both started off with Harry Chesler many years ago. He was a packager – used to package comics, and he used to cheat you like crazy. You were lucky to get paid at the end of the week. It was more fortunate then, as there was time to begin. Now you either have it or you don’t. But then there were always little outfits where you could begin, learn, and grow. Infantino: Yeah! He started that way, and you got nothing for it, but you didn’t care. It was a chance to work, a chance to draw, and that’s all we cared about. 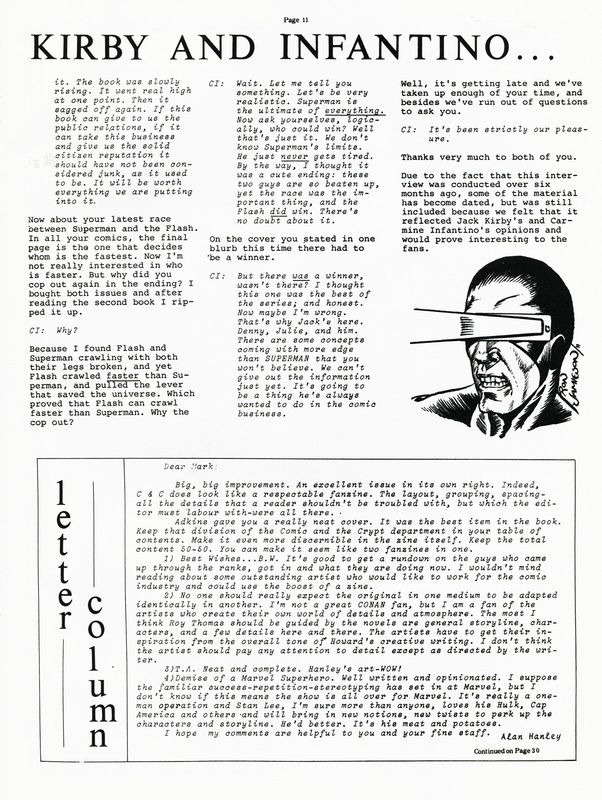 C&C: Were you in a group of independent artists who sold their stories to the publishers? 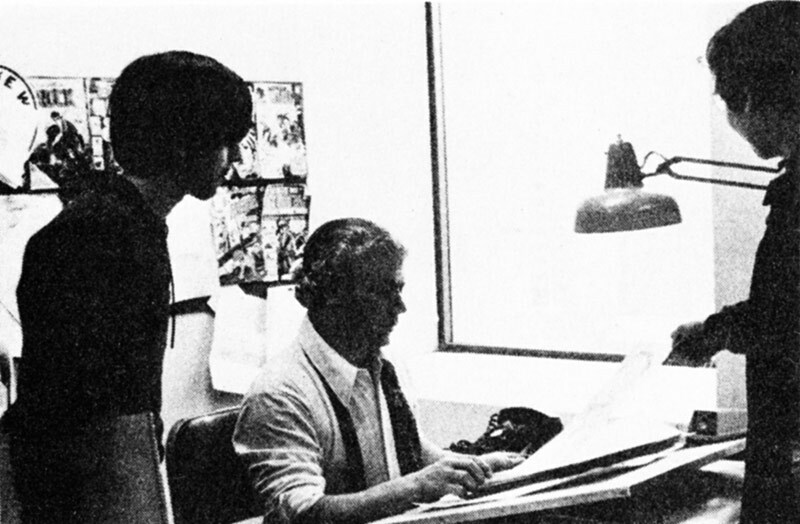 Infantino: No, I worked for Harry for a while; then I went to QUALITY erasing pages and doing backgrounds. Those were the days of Lou Fine and Reed Crandall on BLACKHAWK, and the genius Jack Cole started on PLASTIC MAN. I used to erase pages all summer just to get a break to start, and that was the beginning. C&C: You seem to be best known for (ADAM) STRANGE and the FLASH. Which did you enjoy the most? Infantino: To tell the truth, I did not like doing westerns, or, strangely enough, the FLASH. As for STRANGE, I enjoyed him at first, but I really liked the ELONGATED MAN. I’m sure this goes for you too Jack; the ones you’re best known for aren’t the ones you like best. Kirby: The ones I began weren’t the well-known ones. I began MANHUNTER and MR. SCARLET, which just faded out. Every strip I did was a challenge, as I’m sure it was to Carmine, but I fell what Carmine is trying to say, is that he especially liked one thing but we couldn’t always do that. We did what they gave us to do. Infantino: I could never do a sci-­fi story the way he could. C&C: But your speed concepts and futuristic cities were amazing. Infantino: Did you see the ones he did? Infantino: This isn’t what I’m trying to say. This is not what I enjoyed the most. I enjoyed the ELONGATED MAN because of the satire in there. Well, let me say something. Back in the early days there was quite a lot wrong with my drawing and every once in a while I would go up to this fellow in the city. We’d talk and he’d help me. But the most important thing he helped me do was think, and I feel his was one of the best around. When I went up there, he used to stop his work and look at my stuff and give me suggestions. That person was Jack. Kirby: Well I’m not going to take credit for that. 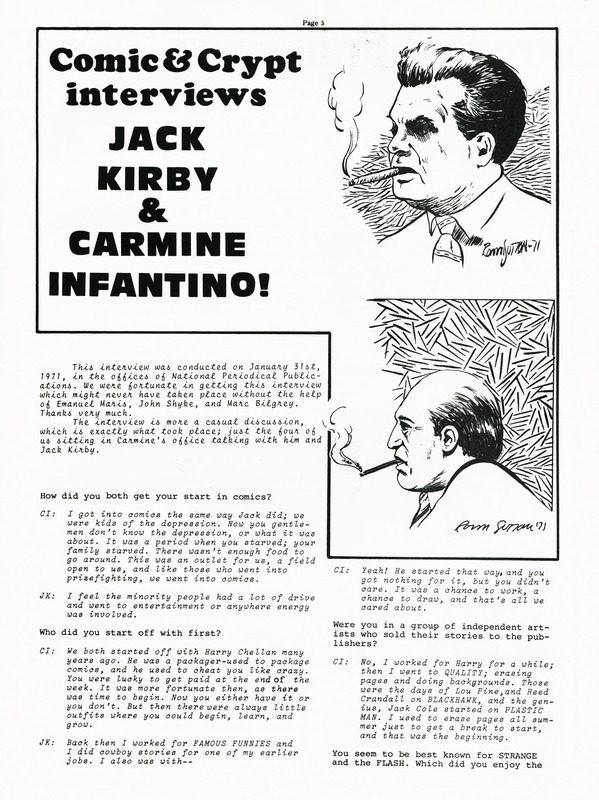 Carmine was and is a fine artist, but back then Joe Simon and I used to have an apartment up there. All the guys got together and I think we helped each other actually. That was the main purpose back then as none of us had a school; we became each others’ school. There were things that Carmine knew that I didn’t. It was an exchange and that’s basically how artist’s learned back then. We took standards from each other. 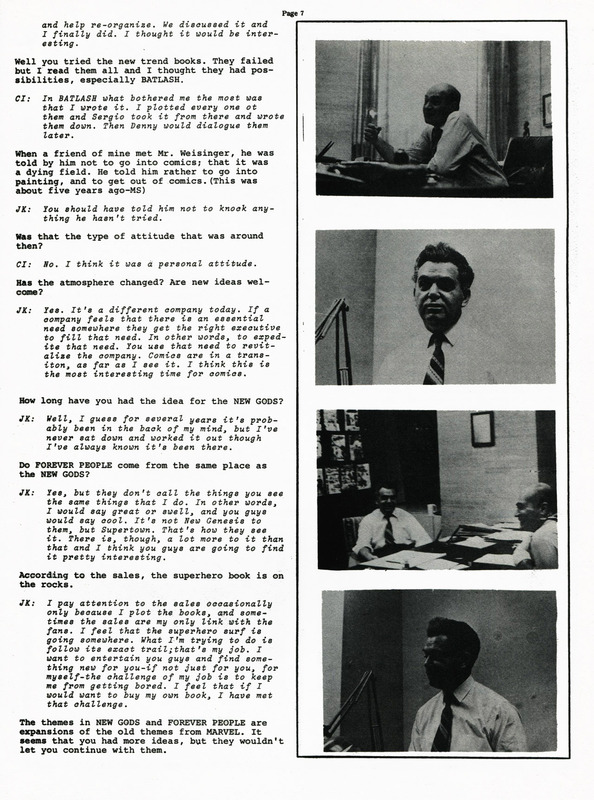 C&C: Just what was your relationship with Joe Simon? How did it start? Kirby: It started the same way all things did in the industry. Some guys gravitated to each other and Joe Simon and I met, liked each other, and decided to work together. C&C: In a lot of your books, you started the sort of panel within a narrative. How did you get the idea for that? Infantino: The reason that was done was because we wanted to get as much motion as possible going, so that when you put that little box in with the silhouette of the batter pulling his bat back; in the next panel you had the follow-through which kept the flow of motion. C&C: But how did you get the idea? Was it a brainstorm of yours or what? Infantino: Well, Julie Schwartz, the editor at the time, told me to go home and make this book look different. C&C: Did you enjoy doing that particular series? Infantino: Yes I did. Maybe it was the sports angle to it. I could design stadiums and futuristic basketball arenas, and the story line made you think. Every book was a challenge. Kirby: I think you hit on the right gimmick. I feel that sports books are the toughest books to do. To do it in the first place is a challenge. To do it effectively was an achievement of some kind. I never had the opportunity to do it but I still feel that it would be a challenge. Infantino: I must have pencilled a page a day on that stuff. That’s how rough it was because you had to make sure the action followed through. If you didn’t, the thing didn’t work. It looked terrible. The bat was back and on the next panel, the ball connected. Then the ball moved out. The thing I enjoyed most was when somebody said I want it different. C&C: We’ve noticed that some comics are featuring covers by you. Do you ever feel like getting back to the drawing board? Infantino: Jack, do you want to answer that for me? 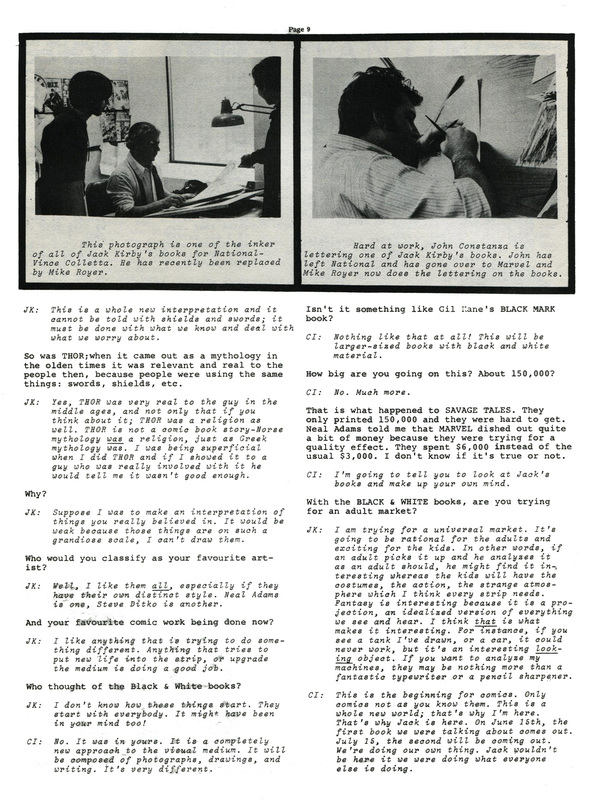 C&C: What led you into becoming Editorial Director? Infantino: An accident. I was drawing here. I think I was drawing the BATMAN and DEADMAN. It was during that story that the second guy at MARVEL was slaughtering NATIONAL. I think his name was Kirby or something, and the gentleman who happened to be in charge at the time asked me if I would care to stop in and help re-organize. We discussed it and I finally did. I thought it would be interesting. C&C: Well you tried the new trend books. They failed but I had them all and I thought they had possibilities, especially BATLASH. Infantino: In BATLASH what bothered me the most was that I wrote it. I plotted every one of them and Sergio took it from there and wrote them down. Then Denny would dialogue them later. Kirby: You should have told him not I’m to knock anything he hasn’t tried. C&C: Was that the type of attitude that was around then? Infantino: No. I think it was a personal attitude. C&C: Has the atmosphere changed? Are new ideas welcome? Kirby: It’s a different company today. If a company feels that there is an essential need somewhere they get the right executive to fill that need. In other words, to expedite that need. You use that need to revitalize the company. Comics are in a transition, as far as I see it. I think this is the most interesting time for comics. C&C: How long have you had the idea for the NEW GODS? Kirby: Well, I guess for several years it’s probably been in the back of my mind, but I’ve never sat down and worked it out though I’ve always known it’s been there. C&C: Do FOREVER PEOPLE come from the same place as the NEW GODS? Kirby: Yes, but they don’t call the things you see the same things that I do. In other words, I would say great or swell, and you guys would say cool. It’s not New Genesis to them, it’s Supertown. That’s how they see it. There is, though, a lot more to it than that and I think you guys are going to find it pretty interesting. C&C: According to the sales, the superhero book is on the rocks. 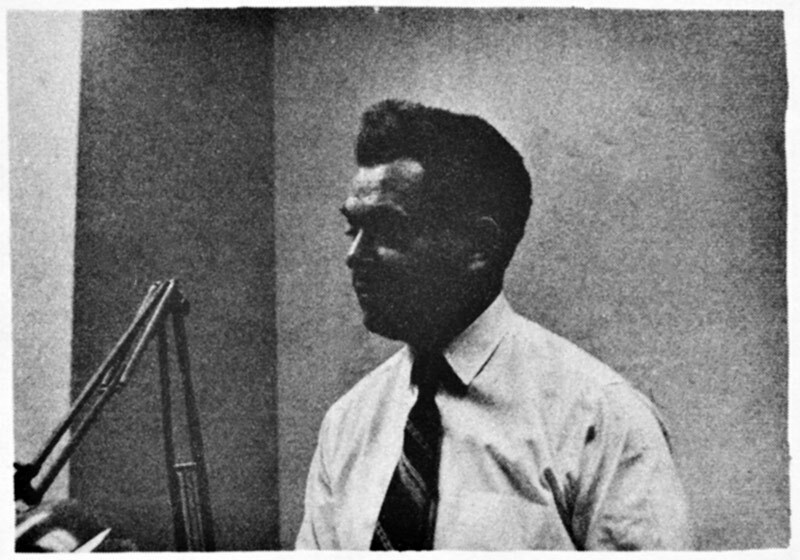 Kirby: I pay attention to the sales occasionally only because I plot the books, and sometimes the sales are my only link with the fans. I feel that the superhero surf is going somewhere. What I’m trying to do is follow its exact trail; that’s my job. I want to entertain you guys and find something new for you – if not just for you, for myself – the challenge of my job is to keep me from getting bored. I feel that if I would want to buy my own book, I have met that challenge. C&C: The themes in NEW GODS and FOREVER PEOPLE are expansions of the old themes from MARVEL. It seems that you had more ideas, but they wouldn’t let you continue with them. Kirby: That’s more or less true. It’s not that I was cramped, but there were limitations which stopped me from going on. Over here I have the chance to go beyond them; I feel. that whatever story there is to this “gods” business, the “new” Gods or the “old” Gods, I feel. that there is a story to them. I feel that there was an actual replacement of the “old” Gods by new ones which are relevant to what we see and hear. In other words, Thor may have been great in medieval times, but I feel, somehow, that we have transcended. Once it had a certain glamour, but now we need a new kind of glamour. Not that it isn’t fantastic, but we don’t see it in the same light anymore. I think we see things differently, the same things with an altered interpretation. You know what Thor looked like, what Mercury looked like, what Zeus looked like, and all the rest of them. It’s like everything that’s done and seen. What I’m trying to do is show the things that haven’t been done or seen. Kirby: We have our “new” GOD today – technology. A new way at looking at things that I have got to represent. How do I represent that new technology? I’ve got Metron. How do I represent the kind of feelings we have today? Maybe some of us are analyzing ourselves, trying to find out why we’re a violent society and how we could be nonviolent, so we all become Orion. Why do these feelings live like that inside of us? Not only do we associate ourselves with them, but these are conflicts. But why do we have conflicts like that inside of us? So we try to analyze it, just like Orion does. That’s what the GODS are. They are just representations of ourselves. At that time, you take a crummy Viking, remove the glamour, and what the heck was he? Some poor guy in bear skins, who never took a bath. He had a beard with lice in it and he says: “Look at me, I’m a really cruddy object.” And I felt the same way. The GIs feel the same way sometimes when they’re sitting in some hole but suddenly he says: “What the heck am I doing? What am I a symbol of?” And then he begins to idealize the version of all the bravery that goes into the fight. Maybe he begins to see himself as Thor and his captain as Odin. Then he sees what he’s fighting for. He sees why he’s in that hole, why he’s in the dirt, why he’s dressed in that stupid uniform. It’s not only functional – it’s symbolic of what he is; he comes into a whole new world and he feels pretty good about it. That’s what it’s all about. To make everything we see and know around and in us, and give it some meaning. Kirby: And the GODS are nothing more than that. They are making us see some value in us and we have ­ we have that value. So in order to express that value, we make “new” GODS. We can’t be Thor. We can’t be Odin, anymore. We’re not a bunch of guys running around in bear skins; we’re guys that wear spacesuits and surgeon’s masks. A surgeon is godlike because he handles life and death. If you want to idealize him that’s the way to do it. A nuclear physicist is Metron. A mathematician is Metron. A guy who works a projection booth in a theater is Metron. He’s involved in technology. We’re trying to know everything and we’ve got the equipment to do it. That’s where Metron’s chair comes in. It’s one of our gadgets. That damn chair can do anything! C&C: There is so much meaning in the strip. I read it and I enjoyed it but I couldn’t place all these things into it, but it’s there. Kirby: It’s there because I’m trying to interpret us. Nothing more than that. I’m trying to interpret what we’re in. What kind of times we live in. And we should have these versions. I can see this guy in a spacesuit. There is no reason why he shouldn’t be able to go to Mars. Maybe in ’75. Because we can do it. The materials are there. They’ll be common. And to put it all in one word that’s Metron. And New Genesis. You name it. That’s New York or Chicago; just an idealized version of that. It’s the city. C&C: Did you ever mention this to MARVEL? Kirby: No. I was involved in what I was doing there and I feel that this would never have fit into what they were doing. This is a whole new interpretation and it cannot be told with shields and swords; it must be done with what we know and deal with what we worry about. C&C: So was THOR; when it came out as a mythology in the olden times it was relevant and real to the people then, because people were using the same things: swords, shields, etc. Kirby: Yes, THOR was very real to the guy in the middle ages and not only that if you think about it; THOR was a religion as well. THOR is not a comic book story – Norse mythology was a religion, just as Greek mythology was. I was being superficial when I did THOR and if I showed it to a guy who was really involved with it he would tell me it wasn’t good enough. Kirby: Suppose I was to make an interpretation of things you really believed in. It would be weak because those things are on such a grandiose scale, I can’t draw them. C&C: Who would you classify as your favorite artist? Kirby: Well, I like them all, especially if they have their own distinct style. Neal Adams is one, Steve Ditko is another. C&C: And your favorite comic work being done now? Kirby: I like anything that is trying to do something different. Anything that tries to put new life into the strip, or upgrade the medium is doing a good job. C&C: Who thought of the Black & White books? Kirby: I don’t know how these things start. They start with everybody. It might have been in your mind, too! Infantino: No. It was in yours. It is a completely new approach to the visual medium. It will be composed of photographs, drawings, and writing. It’s very different. C&C: Isn’t it something like Gil Kane’s BLACKMARK book? Infantino: Nothing like that at all! This will be large-sized book – with black and white material. C&C: How big are you going on this? About 150,000? C&C: That is what happened to SAVAGE TALES. They only printed 150,000 and they were hard to get. 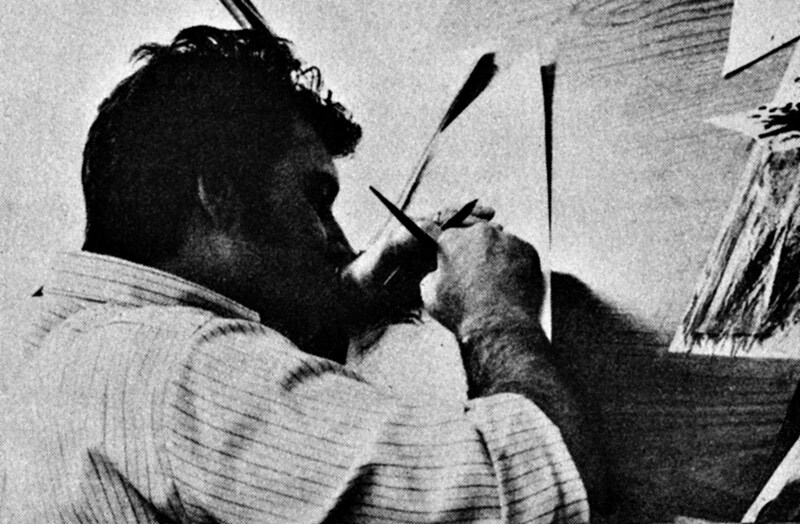 Neal Adams told me that MARVEL dished out quite a bit of money because they were trying for a quality effect. They spent $6,000 instead of the usual $3,000. I don’t know if it’s true or not. Infantino: I’m going to tell you to look at Jack’s books and make up your own mind. C&C: With the BLACK & WHITE books, are you trying for an adult market? Kirby: I am trying for a universal market. It’s going to be rational for the adults and exciting for the kids. In other words, if an adult picks it up and he analyzes it as an adult should, he might find it interesting whereas the kids will have the costumes, the action, the strange atmosphere which I think every strip needs. Fantasy is interesting because it is a projection, an idealized version of everything we see and hear. I think that is what makes it interesting. For instance, if you see a tank I’ve drawn, or a car, it could never work, but it’s an interesting looking object. If you want to analyze my machines, they may be nothing more than a fantastic typewriter or a pencil sharpener. Infantino: This is the beginning for comics. Only comics not as you know them. This is a whole new world; that’s why I’m here. That’s why Jack is here. On June 15th, the first book we were talking about comes out. July 15, the second will be coming out. We’re doing our own thing. Jack wouldn’t be here if we were doing what everyone else is doing. C&C: Some comics, like SUPERBOY don’t have the same flexibility, or even attempt it. As long as they sell. Kirby: They are not made for a universal market. They are not aiming for my market. Infantino: First of all, the SUPERBOY and LOIS LANE books. LOIS LANE is made for the “girl” market. SUPERBOY is the same thing. It’s at another level, though. You don’t mesa around with a book like SUPERBOY, which is selling over 500,000. That’s not saying what will do tomorrow. I don’t know. Jack will develop his own line of books. It will have Jack’s stamp. We have some other stamps. You’ll buy these or you won’t. But to turn out one stamp in a company I can’t feel is very good. 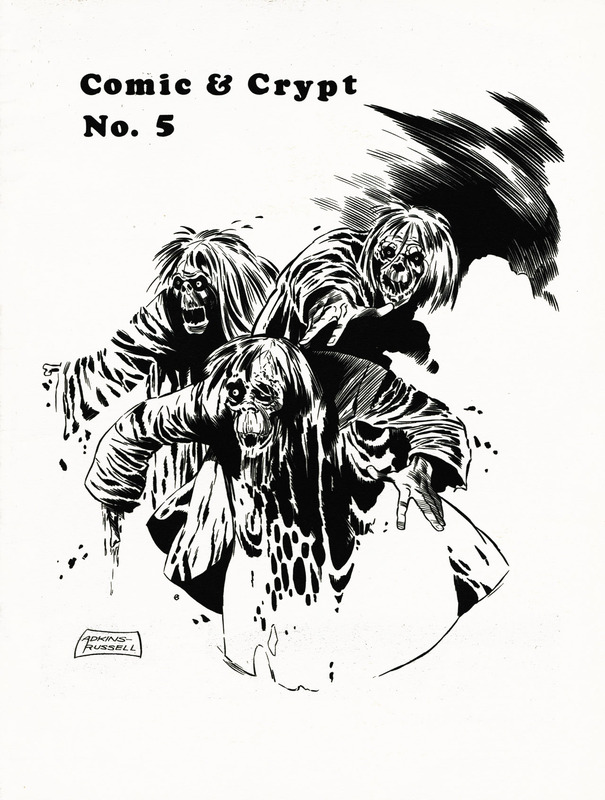 C&C: Did you like Gray Morrow on EL DIABLO? Infantino: No, I did not like his artwork. I told him I didn’t. That does not mean that Gray is not a talented man. I thought that Gray should be on other things that he could do well. C&C: What did you think of his work on WITCHING HOUR? Infantino: Beautiful. That’s Gray’s field. C&C: Are you considering making the new books monthly? Infantino: I don’t know. If Jack’s books turn monthly, can Jack do all of the work by himself? I’m not going to ruin him. I’m not going to spread this guy so far that it’ll destroy him. And I won’t let anybody else do his characters. Nobody touches his characters! He knows what he’s doing with them. Kirby: SILVER SURFER was taken out of my hands. I originated it because I had a reason for the SILVER SURFER. Nobody else had a reason for him; I knew the SILVER SURFER. Nobody else did. 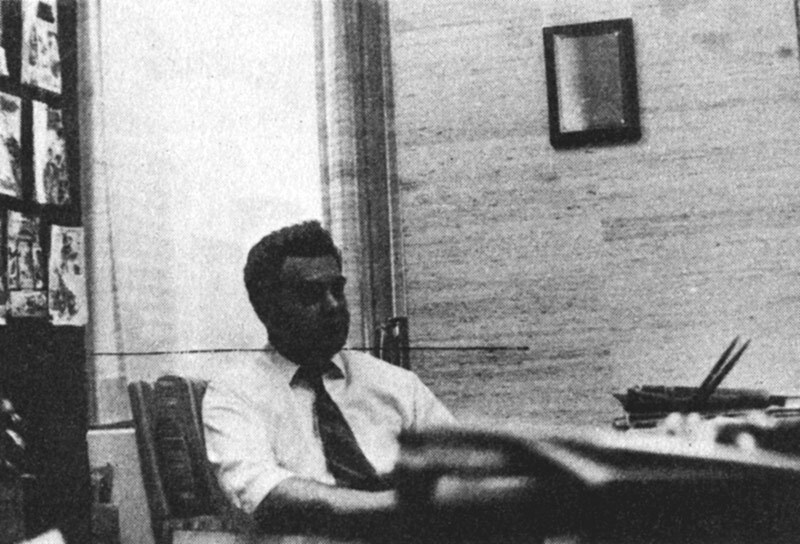 Infantino: Jimmy Steranko was offered the FANTASTIC FOUR but he turned it down. He said he wouldn’t presume to follow Kirby. C&C: Let’s say in ten years from now the same thing happens at NATIONAL that happened at MARVEL, where your books are selling very well and all of a sudden Jack Kirby says he wants to retire. 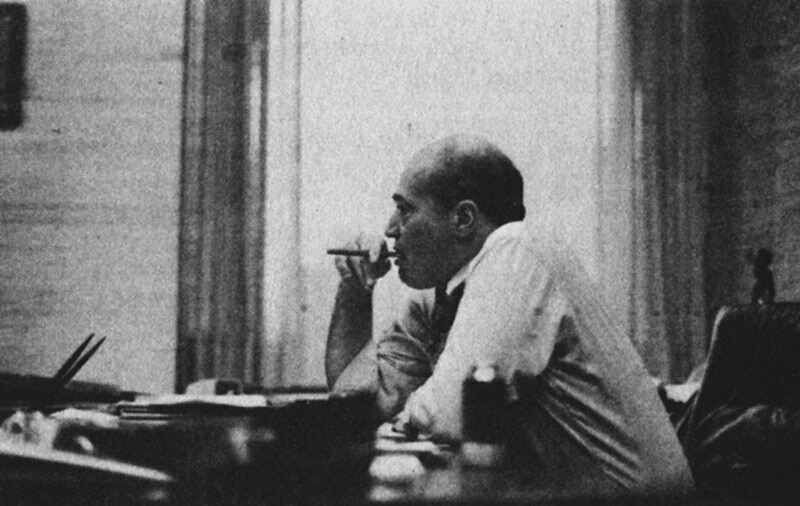 Infantino: Then I wouldn’t presume to do those books, because nobody could do them as well. Infantino: Yes. Wouldn’t it be better for us to drop them then for the books to die themselves? C&C: How could somebody like MARVEL drop the FANTASTIC FOUR? Infantino: It’s going to die anyway. Infantino: Would you rather die at your zenith or at your low end? First of all, he’s not going to retire in ten years anyway; I wouldn’t let him. Kirby: Second of all, I think that even if I did retire, the comics would continue with the same feeling. Infantino: He is planning to develop people for these books in case the need comes. He wants people developed to follow his thinking. C&C: Who got the idea for the Neal Adams GREEN LANTERN book? The sales are dropping. I know they went up and now they’re dropping a little bit. I don’t know how true it is. C&C: Neal Adams. I heard that you are keeping it for prestige. I’d like to know how it got started. Infantino: The GREEN LANTERN was ready to be turned out when we were told to drop it. Even though I wanted a few more issues. I said to Julie: “There’s something you wanted to try.” I want this book as different as you could possibly make it. We sat down with Denny and came out with it. The book was slowly rising. It went real high at one point. Then it sagged off again. If this book can give to us the public relations, if it can take this business and give us the solid citizen reputation it should have not been considered junk, as it used to be. It will be worth everything we are putting into it. C&C: Now about your latest race between Superman and the Flash. In all your comics, the final page is the one that decides whom is the fastest. Now I’m not really interested in who is faster. But why did you cop out again in the ending? I bought both issues and after reading the second book I ripped it up. C&C: Because I found Flash and Superman crawling with both their legs broken, and yet Flash crawled faster than Su­perman, and pulled the lever that saved the universe. Which proved that Flash can crawl faster than Superman. Why the cop out? Infantino: Wait. Let me tell you something. Let’s be very realistic. Superman is the ultimate of everything. Now ask yourselves, logically, who could win? Well that’s just it. We don’t know Superman’s limits. He just never’ gets tired. By the way, I thought it was a cute ending: these two guys are so beaten up, yet the race was the important thing, and the Flash did win. There’a no doubt about it. C&C: On the cover you stated in one blurb this time there had to be a winner. Infantino: But there was a winner, wasn’t there? I thought this one was the best of the series and honest. Now maybe I’m wrong. That’s why Jack’s here. Denny, Julie, and him. There are some concepts coming with more edge than SUPERMAN that you won’t believe. We can’t give out the information just yet. It’s going to be a thing he’s always wanted to do in the comic business. C&C: Well, it’s getting late and we’ve taken up enough of your time, and besides we’ve run out of questions to ask you. Infantino: It’s been strictly our pleasure. C&C: Thanks very much to both of you. 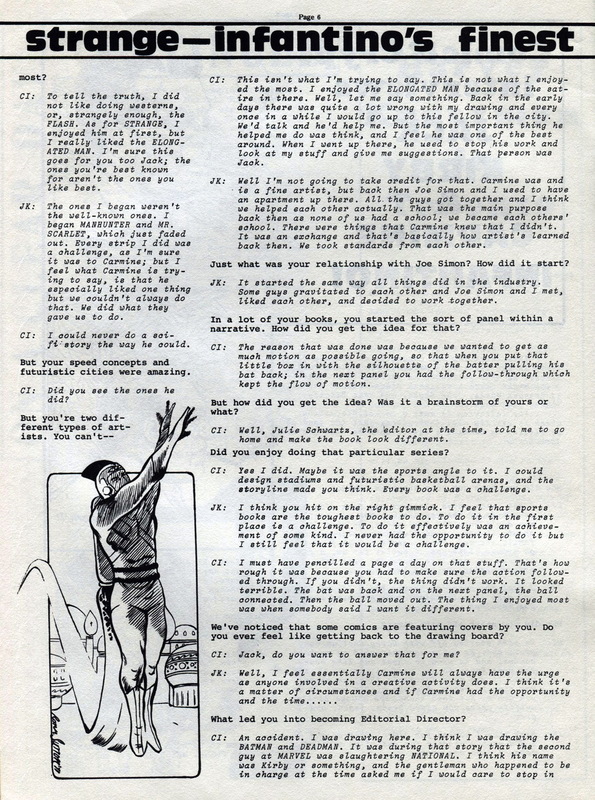 Due to the fact that this interview was conducted over six months ago, some of the material has become dated, but was still included because we felt that it reflected Jack Kirby’s and Carmine Infantino’s opinions and would prove interesting to the fans.